Industrial....Chic - Jill Ruth & Co.
Margo is having her first linky party and the theme is Industrial Chic. I want to play along even though I don't have a lot to show. I do love industrial pieces, and over time more will make their way into our home. This past spring I painted our upstairs bathroom. Gray..but you can't tell it from the photos. 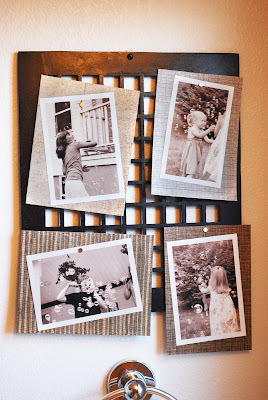 I hung this iron grate to hold photos. I had taken pictures of the kids (who use this bathroom) blowing bubbles once and thought it'd be fun to put them up in here. This isn't exactly "Industrial" but kind of...and it goes along with the look. Our only window in the upstairs bathroom is this small one and not wanting to block out any bit of natural light, I only have a small valance in it. This one I made from recycled shopping bags. Anyone remember this post?! Well I melted more bags to make my valance and then used them also to make the flower that I pinned to it. There is a vintage metal button in the center! The valance "fabric" is somewhat transparent and is sleek, vintage, and recycled! Now, is this industrial chic? Well, probably not, but I love this and decided to share it anyway. My jar of rust. All this lovely rusty junk came from my Dad's shop (which is an old house literally falling down). The "lid" is a cog of some sort. And, this sits in a place of prominence in my Hoosier in our dining room. Now, head over to Margo's to see some wonderful decorating with some great industrial pieces! you have some wonderful ideas. I could store all my husbands junk in jars.....off to the shed I go! I love it all. Industrial on the small scale is perfect. I especially love the "Jar of Rust" Great name. Loved this post. What a fun idea to put pictures of your kids blowing bubble in the bathroom. I am SO impressed with the valance and flower you made from recycled shopping bags. I'm going to have to go hunt for that post. And love the jar of rusty pieces and parts....I have a drawer that looks like that. I LOVE your take on Industrial Chic....!! The grate & blackboard in the bathroom are GORGEOUS touches & your 'melted' shopping bag valance is WAY WICKED....!! 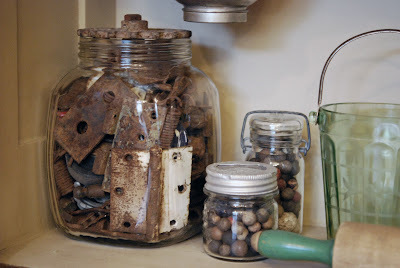 Your jar of rust speaks to me unlike any other jar of vintage bits & bobs I've ever laid my on eyes.... ** sigh ** ....!! Have a GREAT weekend Lovey....! I have several rusted hinges, door plates, etc. I liked the look of them in the jar. I may have to do the same! LOL! Your calendar and mine both are behind! Love the Jar of rust. My hubby stores all of his rusty bits, screws etc. in big jars too. 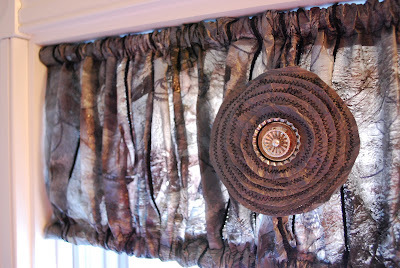 How cool is that valance idea! 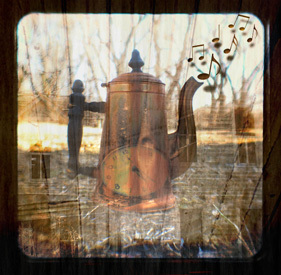 PS - Come over sometimes and join in for Vintage Love Saturday on my blog. This week we are sharing vintage photos and you are welcome to join in! Your creativity is so inspiring, Jill! Very precious how you personalized the children's bathroom with their photos. But that jar of rusted bits and bobs from your dad's shop...love, love, love this! Am also a HUGE FAN of those clay marbles! I'm still kicking myself for not having scooped up more of my dad's junk when he passed. But I was traveling 1200 miles back and forth to the old homestead and well...you know how it goes. Hi Jill, am loving that photo board, so wonderful to meet you at margos linky party!! ps. love those jars of goodies too! 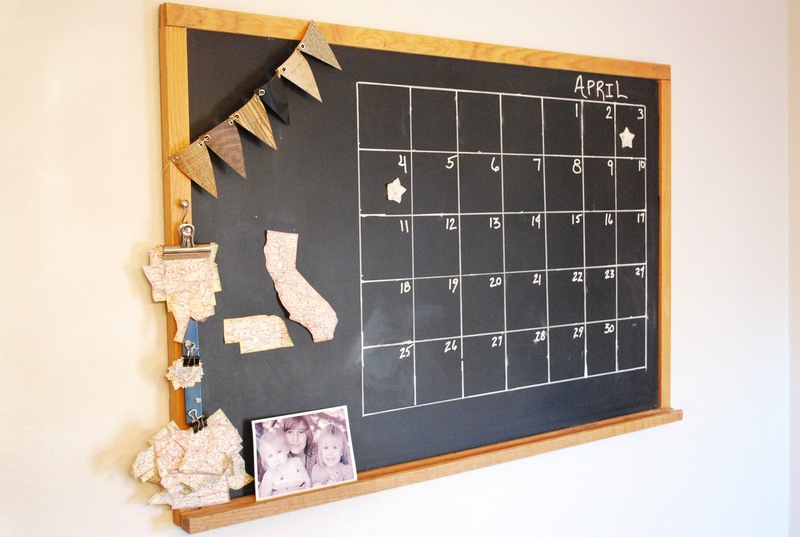 How fun is that blackboard and I think the heater grate is so clever too!! The valance is so cool. That cog used as a lid is soooooo clever. I love that and your jar of rust.